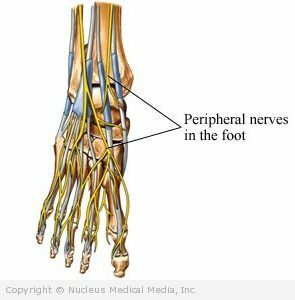 Peripheral neuropathy is damage to the peripheral nerves. These are the nerves that connect your spinal cord to the rest of your body. Other parts of the body can also be affected. Symptoms depend on which nerves are involved. They can range from mild to severe and may seem worse at night. Sensations and pain may occur in the upper or lower limbs and move toward the trunk (eg, from the feet to the calves). Treating the underlying illness can decrease or eliminate symptoms. For instance, if it is caused by diabetes, controlling blood sugar levels may help. In some cases, neuropathy caused by medications or toxins is completely reversed when these substances are stopped or avoided. Correction of vitamin B12 deficiency often improves symptoms. Certain exercises may help stretch shortened or contracted muscles and increase joint flexibility. In long-standing cases, splinting the joint may be required to protect and rest it, while maintaining proper alignment. Maintaining physical activity is also key. Prescription and over-the-counter (OTC) pain medicines are often used to ease discomfort. According to the Food and Drug Administration (FDA), patients of Asian ancestry who have a certain gene, called HLA-B*1502, and take carbamazepine are at risk for dangerous or even fatal skin reactions. If you are of Asian descent, the FDA recommends that you get tested for this gene before taking carbamazepine. If you have been taking this medication for a few months with no skin reactions, then you are at low risk of developing these reactions. Talk to your doctor before stopping this medication. Surgery can relieve the pressure on nerves. For example, surgeons commonly release fibrous bands in the wrist to treat carpal tunnel syndrome. Manage chronic medical conditions with the help of your doctor. If you have diabetes, visit a podiatrist for yearly exams. Eat a healthful diet, one that is low in saturated fat and rich in whole grains, fruits, and vegetables. Be sure to get the right amounts of thiamin and vitamin B12. Limit your alcohol intake to a moderate level. This means two or fewer drinks per day for men and one or fewer for women.